The long-awaited Vita edition of Minecraft will be landing in the PlayStation Store on October 14th. It can be hard being a PlayStation Vita fan. You've fallen in love with this genuinely impressive piece of gaming hardware, you buy a ton of games for it and you're rewarded with industry support that's lackluster at best. That being the case, next week could mark one of the biggest boons that the portable's players have received in a long time: the long awaited release of the Vita edition of Minecraft. According to a new announcement from Sony, the highly anticipated Vita version will be added to the PlayStation Store as a digital download next Tuesday, October 14th. The retail edition will, in turn, make its way to stores on November 11th. Both versions will sell for $19.99. Players who already own the PS3 edition of the game will receive the Vita game for free. Those two games will also be Cross Play compatible, allowing players to transfer their data from console to portable at will. 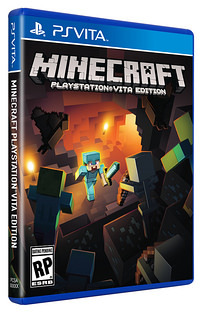 While the Vita version won't share quite the same level of compatibility with the PS4 edition, it's worth noting that PlayStation customers who buy the Vita game will be eligible for a $4.99 upgrade to the PS4 release of Minecraft. The release of Minecraft on Vita is likely to come as a relief to PlayStation customers, especially in the light of the still recent purchase of the game's developer Mojang by Microsoft. While it would eventually be confirmed that Microsoft had no current intention of disrupting plans to port the game to its competitor's consoles, the acquisition still added some understandable anxiety for Vita devotees who had already been waiting a considerable amount of time for their version to arrive.